for sites receiving afternoon shade. Agastache spp. and hybrids - Anise Hyssop - Perennial only if given very well drained soil. Melissa officinalis - Lemon Balm - Perennial Herb - The folaige of this 2' tall herb is used medicinally or in the kitchen. It occasionally produces small, white blooms. Monardas are widely grown as ornamentals in much of this country, but most cultivars are ravaged by powdery mildew. 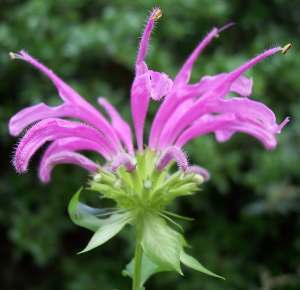 Bartlett's Beebalm, along with the related, crimson flowered, Monarda pringlei, Pringle's Beebalm, are resistant to that fungal plague. These perennial members of the Mint Family are found in the northern parts of the Sierra Madre Oriental of Mexico. Both do best with morning sun and afternoon shade, as well as good drainage. Their terminal whorls of blooms in mid- to late-spring attract butterflies and hummingbirds. The oregano-scented leaves have culinary applications. Though they thrive in central Texas, they are seldom propagated or sold. Perovskia atriplicifolia 'Filigran' - 'Filigran' Russian Sage - Perennial - An outstanding selection with deeply cut foliage. Needs full sun and can grow to 3' high and 4' wide. The blue flowers are produced from late spring until frost. We were pleased to introduce to cultivation one of the rarest plants of North America. While this clump-forming, 6' to 8' tall summer-blooming species is known from only five or six sites, it is extremely easy-to-grow in full sun. If well-fed, its stems can be up to 1" square at the base. The leaves, with coarsely toothed margins, are thick and succulent, somewhat like a Kalanchoe. 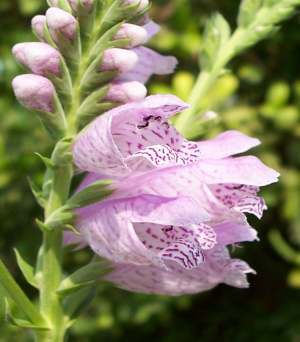 Lavender-pink flowers, spotted or streaked with purple, are slightly more than 1" long and are borne on spikes that can exceed 2 feet in length. These plants are propagated from rhizome divisions obtained from an undisclosed location in the Texas Hill Country. Looks best if given a deep watering every week during a dry summer. See more about this plant at this page. Rosmarinus officinalis 'Spice Islands' - 'Spice Islands' Rosemary - Perennial Herb - A tall, narrow selection. Needs full sun and perfect drainage. Salvia blepharophylla - Eye-Lash Leaf Sage - Tender Perennial - Its red blooms are much larger than Cherry Sage and it spreads by rhizomes. Cultivars include: 'Diablo', 'Dulces Nombres' & 'Painted Ladies'. Salvia chamaedryoides - Germander Sage - Perennial - A dwarf shrub with blue to deep-royal-blue flowers on low, spreading mounds of foliage. Requires full sun. Salvia chionophylla - Indigo Cherry Sage - Perennial - A compact, Cherry Sage cousin with deep indigo-purple flowers and a wonderful foliar aroma. Salvia coahuilensis - Coahuila Sage - Perennial - Similar to S. chionophylla and S. chamaedryoides; with small purplish flowers. Salvia coccinea - Scarlet Sage - Perennial - A weed, but a pretty one. In spite of its Latin name, available in red, pink, white or bi-colored forms. Does best in semi-shade. Caution: It self-sows readily. Salvia farinacea - Mealy Blue Sage - Perennial - Though it looks great as a wildflower, it tends to suffer from powdery mildew in cultivation. Salvia farinacea X longispicata 'Indigo Spires' - 'Indigo Spires' Sage - Perennial - It grows too large, the leaves wilt most summer afternoons and its blue flowers are too small. NOT RECOMMENDED due to its miniscule flowers. Salvia farinacea X longispicata 'Mystic Spires Blue' - 'Mystic Spires Blue' Sage - Perennial – Similar to 'Indigo Spires' Sage, but a dwarf selection, said to grow to 12” to 14 “. NOT RECOMMENDED due to its miniscule flowers. Salvia greggii - Cherry Sage - Perennial - The best-adapted salvia for most gardens; almost foolproof in sunny sites. This excellent hummingbird attractant can grow to 3' high and 4' wide. Cultivars include: 'Alba', 'Big Pink', 'Cherry Chief', 'Cherry Queen', 'Cherry Red', 'Compact Orange', 'Dwarf Pink', 'Furman's Red', 'La Encantada Peach', 'Lowrey's Peach', 'Señorita Leah' & 'Yucca-Do Orange'. Salvia greggii X muelleri - Violet Cherry Sage - Perennial - A robust hybrid much like Cherry Sage, differing only in flower color. Cultivars and forms include: Burgundy & 'Diane'. 'Dark Dancer' might belong here too. Salvia guaranitica - Big Blue Sage - Perennial - The best blue-flowered sage for semi-sunny sites. Cultivars and selections include: 'Argentina Skies', 'Black & Blue', 'Blue Ensign', Brazil & Costa Rica. Salvia guaranitica X gesneraeflora 'Purple Majesty' - Perennial - 'Purple Majesty' Sage - Produces deep-purple flowers on 4' to 6' stems. Thrives with morning sun and afternoon shade. Needs ample watering. Salvia involucrata - Fuchsia Sage - Perennial - Hummingbirds will not depart a garden so long as, these inflated, velvety-textured fuchsia-red flowers are present. One of the better fall-bloomers for semi-shade. Salvia X jamensis - Jamé Hybrid Sage - Tender Perennial in our poorly drained clay soils - A complex hybrid group whose parents include S. greggii & S. microphylla. The generally spindly plants need frequent clipping. I have seen them in habitat in the mountains near Jamé, Coahuila where most clones of the vast hybrid swarm had very small flowers. Cultivars include: 'Cienega de Oro' (pale yellow), 'Devantville' (orange), 'La Luna' aka 'Moonlight' (yellow), 'La Siesta' (pink), 'La Tarde' (pink & peach), 'Pat Vlasto' (peach), 'San Isidro Moon' (light peach), 'San Takao' & 'Sierra San Antonio' aka 'San Antonio' (bi-colored dark peach and yellow). Salvia leucantha- Mexican Bush Sage - Perennial - The flowers are usually white (violet-purple in one form). The persistent and showy purple calyx gets all the attention. Requires full sun. Cultivars include: 'Eder', 'Midnight' (purple flowers) & 'Waverly' (probably a hybrid with S. chiapensis). Salvia leucantha x elegans 'Anthony Parker' - Perennial - An unusual hybrid with dark purple flowers, the result of chance pollination in a garden in Beaufort, South Carolina. Salvia lycioides - Canyon Sage - Perennial - Hard to grow in clay soil with irrigation. Has blue flowers and wonderfully aromatic leaves. Hybrids with S. greggii are not so delicate: 'Nuevo Leon Sage', 'Los Lirios' & 'San Isidro'. Salvia lyrata - Lyre-Leaf Sage - Perennial - A groundcover with very showy foliage for shady, woodland gardens. It bears insignificant blue flowers and self-sows prolifically. Salvia madrensis - Big Yellow Sage - Perennial - A giant among Salvias, reaching up to 10 feet in late fall as the large spikes of sticky, yellow blooms appear. For best results, give it afternoon shade and mulch deeply. Salvia microphylla - Little-Leaf Sage - Perennial - Semi-evergreen mounds to 4 feet high and wide with red, pink or purple blooms. Cultivars, forms and varieties include: '18 de Marzo', Deltoid-Leaved, grahamii, Hidalgo, 'Hoja Grande', Huntington, 'La Trinidad', neurepia, 'Orange Door', 'Rosita', 'San Carlos Festival', 'Wild Watermelon' & 'Zaragoza'. Hybrids with S. schaffneri include: 'Silke's Dream'. Salvia microphylla X greggii - Hybrid Cherry Sage - Perennial - Though these share the same parent species as Salvia X jamensis, these are not derived ftom the hybrid swarm near Jamé, Coahuila and in general have much larger flowers and live longer in our clay soils. The following are available: 'Maraschino', 'Plum Wine', 'Red Velvet' & 'Raspberry Royale'. Salvia muelleri - Violet Cherry Sage - Perennial - A Cherry Sage cousin with violet to purple blooms. I have seen this species in a spectacular and deep, rain-shadow valley in the Sierra Madre Oriental southwest of Monterrey, one mountain range south of the village of El Pajonal, the habitat of Agave albopilosa..
Salvia patens - True Blue Sage - Perennial - Needs shade, perfect drainage and even moisture while growing. Cultivars include: 'Cambridge Blue', 'Chilcombe', 'Guanajuato', 'Lavender Lady', 'Oxford Blue' & 'White Trophy'. Salvia penstemonoides - Penstemon Sage - Perennial - This graceful Texas native was rescued from the brink of extinction to elevate our gardens with its tall spikes of wine-red flowers in mid to late summer. Salvia puberula 'El Butano' - 'El Butano' Sage - Perennial - While this species is usually not reliably winter-hardy, the clone, 'El Butano', from a high elevation site south of Monterrey is spectacular every fall. Needs afternoon shade. Salvia regla - Mountain Sage - Perennial - Though clones from the Chisos Mountains are cold-hardier, forms from near Saltillo are showier. Can grow 4' to 8' tall. Needs perfect drainage and afternoon shade. Cultivars and selections include: Hidalgo, Jame, 'Mount Emory' & 'Warnock's Choice'. Salvia roemeriana - Cedar Sage - Perennial - An outstanding Texas native for shade. Named 'Cedar Sage' since it often grows under Ashe Junipers, called “Cedar” in the vernacular. 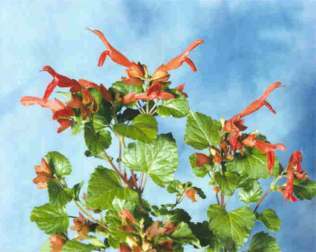 Has red, hummingbird-pollinated flowers spring through early fall, an evergreen, over-wintering rosette and great drought-tolerance. Generally remains under 18" high. Salvia schaffneri (this is likely the correct name of S. darcyi) (S. oresbia included?) - Schaffner's Sage - Perennial - Will produce a spectacular display of large red blooms over mounds of attractive, aromatic foliage for many months. Best for wild gardens since it spreads invasively by rhizomes. Salvia sinaloensis - Sinaloa Sage - Perennial - Produces low-growing mounds of foliage topped by short spikes of sapphire-blue flowers. Best grown as a groundcover. Salvia uliginosa - Bog Sage - Perennial - Its miniscule blue flowers and invasive tendencies render it unworthy of cultivation. NOT RECOMMENDED. Scutellaria suffrutescens - Mexican Skullcap - Perennial - An evergreen perennial under 10" high with pink or yellow blooms throughout the growing season. Does best in full sun and is very drought-tolerant once established. Teucrium chamaedrys - Germander - Perennial Herb - A low, evergreen old-world ornamental usually used as a border in traditional herb gardens. Thymus - Thyme - Herb, generally short-lived in our clay soils.